Christine McCombe is a Melbourne-based composer, teacher and writer. This CD contains four of her chamber works, all in world premiere recordings. It is also the first CD of her chamber works to be released. After initial studies in composition at the University of Melbourne and the Victorian College of the Arts, Christine moved to the UK in 1997 to study with James MacMillan at the Royal Scottish Academy of Music and Drama, and later completed a PhD in composition at the University of Edinburgh. Composition prizes and awards include the The Dorian Le Gallienne Composition Award and a Bundanon Artists Trust Residency. Christine’s musical influences include Bach, Messiaen and PJ Harvey. She works in a range of forms from chamber music to electroacoustic composition and video. 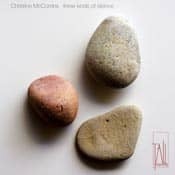 The CD cover image gives one an inkling of the appealing aesthetic one finds in Christine McCombe’s music on this CD, particularly in her minimalist piece the art of placing stones (2010) for violin and piano. It was composed at the time when her two children were very young, and she was sleep-deprived, unable to concentrate for long periods. So she created miniature pieces of around a minute each, aiming to distill an essence or quality in each, and then placed them in a certain order with specified periods of silence between them to create a meaningful whole lasting just over 11 minutes. McCombe says she was exploring the Japanese concept of ‘ma’ – here as applied to music, where the spaces (in music the silences) between things are as significant as the things themselves. The spaces between frame and give context to the objects. So in Japanese gardens for example, the artists find the particular simple arrangement of stones etc that ‘works’. We know when they feel ‘right’ – a mystery really but no doubt neuroscientists will soon be able to explain it in terms of which parts of the brain are tickled! McCombe certainly achieves this sense of rightness and beauty in this sparse, finely honed work which is very beautiful indeed. For me it evoked two people conversing – initially arguing, talking over the top of each other, then gradually stopping to listen to the other’s point of view, often repeating phrases and waiting for the other’s reaction, then contemplating same, and eventually coming to a gentle compromise. Whether McCombe ever had such conversations in mind is irrelevant – it certainly isn’t mentioned in her notes – and it would probably evoke other things for other listeners – but my point is that the work does not sound like an intellectual exercise divorced from life. It relates to us directly in a fascinating way. And along the journey there are no unnecessary notes (or silences!) and no artifice. Silence as a musical parameter is used innovatively in all these four chamber works – creating the feeling of different spaces, evoking different aspects of time and the resulting emotional effects. McCombe has been thinking about this now for three decades. Her article in Resonate Magazine 25 July 2018 called Insight: Accepting Silence makes for excellent reading and refers to her concepts underlying these chamber pieces in detail. She is a fine writer and having been so impressed by her music I found her full discussion further enhanced my enjoyment. Her academic background is that in 2003 she completed a PhD in composition at the University of Edinburgh, having gained her undergraduate degree at Melbourne University. Not surprisingly, she won many prizes and awards along the way. Since returning to Australia in 1997, she has taught at various universities and currently lives and works in Melbourne as composer, digital artist, piano teacher, art therapist, writer and lecturer in sound and music composition. Her chamber music has been performed by leading ensembles (including the BBC Scottish Symphony Orchestra, soloists from the Scottish Chamber Orchestra, the Vienna Piano Trio, Topology Ensemble, the Australia Ensemble and the Australian Chamber Choir). Violent Clouds for bass flute, soprano and soundscape premiered at the 2016 Resonant Bodies Festival in New York, Ebb Tide for contralto, cello, clarinet and percussion at the NGV / Federation Square Melbourne in September 2017, and the Arcko Symphonic Ensemble in October 2017 performed Night Alchemy for chamber ensemble in Melbourne. Love into Stone for string quartet and piano is the first piece and the oldest of her works here, dating from 1997. It’s a ten minute work and McCombe writes that the inspiration came as she wandered in the famous Glasgow Necropolis (a huge cemetery) shortly after moving to the UK. At the time she felt a bit dislocated and solitary, far from Australia, her home. Meandering her way amongst the stone memorials she pondered how life continues despite losing loved ones. Throughout this beautiful piece, she balances contrasts in musical elements – loud and soft, fast and slow, textures sparse and dense, the highest and lowest registers of the instruments, rising and descending phrases, with all the instruments contributing equally. There is the rush of a strong emotion, for me like grief, after a slow introduction, but this dissolves and the music takes on a compassionate quality which I think she achieves by the expansive rising and falling phrases that seem like a loving embrace. The next, the most recent work (2015) on the CD, To the wider ocean for mezzo and piano trio, is a far more demanding piece for the listener. Firstly the texts of the four extraordinary poems by Alison Croggon (b.1962) are very powerful, rich in imagery but using minimal means (reminiscent of Emily Dickinson and Rainer Maria Rilke). They are the inner thoughts of a mother, expressed in the first person, as she contemplates her born and unborn child. There are references to the sea in each poem. Dark and ambivalent feelings are expressed along with the joy and wonderment of creation. Mezzo soprano Deborah Kayser does a splendid job using a disembodied straight tone that seems to come from within one’s own mind. The music moves slowly giving one time to absorb the ebb and flow of the emotions expressed so subtly. There is no hierarchy between voice and instruments – sometimes they are pursuing different paths and seem disconnected and the work holds one in its grip throughout, with its strange ambiguity. It grew on me with repeated hearings. In 2013, in Edinburgh, Three kinds of silence, the last piece, was premiered by the Artisan Trio who had commissioned it. McCombe’s inspiration came from two main sources: the musicologist Thomas Clifton’s 1976 essay ‘ The Poetics of Musical Silence’ and Jonathan Kramer’s book The Time of Music. She writes: ‘Kramer’s way of describing the temporal aspects of music, the experience of time in music, stirred my imagination and has had a lasting impact on how I think about the passing of time through music’ (from her article in Resonate Magazine above). The first movement, called ‘time interrupted’, has the piano, cello and violin, equal partners, playing gentle rising scalar passages that end abruptly with a slight crescendo. The instruments alternate as to which starts the short phrases. These abrupt endings create tension and really focus one’s attention – was that a question, or anger, or surprise, or was it someone leaving the room? It is amazing how evocative these silences are and how I found myself listening intently with my eyes closed to the unfolding of this musical story! The second movement is called ‘felt but not heard’ and in the third, ‘possibility and ending’ she is exploring endings. She quotes Clifton: ‘As is so often the case, music can act as a kind of sonic analog for things other than music. Consider the way music presents the essence of dying. A musical ending is in effect a disengaging with the possibility of further relationships. The piece becomes “absent”. When silence intervenes… the piece itself passes over into nothingness.’ McCombe writes further: ‘Such a powerful and beautiful way to think about the nature of ending, musical or otherwise.’ She also says the third section was her way of expressing her grief at the death of her mother, of expressing that sense of loss and her absence from her life. All three pieces work wonderfully well. I have concentrated on the pieces but should mention that the players are superb with excellent ensemble playing. McCombe says: ‘I think music should aspire to create a space for contemplation. Every piece of music I write, or work that I create, strives for this in different ways but a common thread is the strangeness and beauty of human experience.’ She has made an important contribution with this recording and I am looking forwards to her next disc. She writes ‘listening to music allows us to experience much more than sound. Though its unfolding in time and space, music can allow us to reflect on the experience of being human’. She’s so right and her music does just this in a compassionate and beautiful manner and leaves one refreshed but also with food for more thought. I also like the way she is pushing against the tide in our busy, noisy society where silence and thinking are SOO unfashionable!